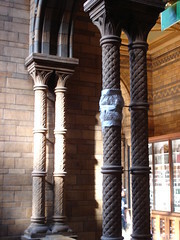 The Natural History Museum’s majestic and inspiring exterior is equally intricate and informative on the interior. 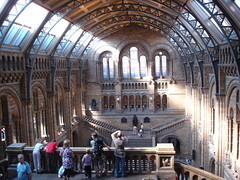 As one of the city’s major attractions you may encounter lines around the outside of the building. Luckily, on this day it was straight into the museum (well after having my bag inspected). Besides the standard wandering around and looking at all of the exhibits the museum also has an audio tour discussing the architecture – apparently this is not available for the next few months. 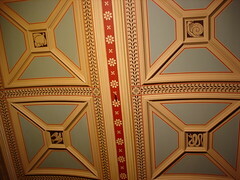 Throughout the entire building the artwork, motifs and finishing touches create a warm and inviting experience that promotes a sense of history and education. 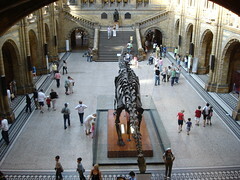 The main hall features in its centre a dinosaur skeleton and from here you can walk into all of the various halls. 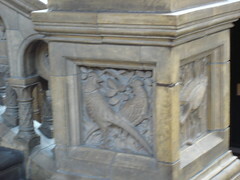 One of, if not the most popular sections are the aforementioned dinosaurs and understandably so. Calling them massive and old or massively old does not do all of the fossilised flora and fauna on display any measure of justice. I’m even more impressed by archaeologists for discerning the differences and history of something based on its bones (or fossilised skin). About mid way through this exhibit you will come across an animatronic T-Rex and it is completely cheesy, although one poor little girl to the chagrin of her mother was terrified and refused to walk past it. 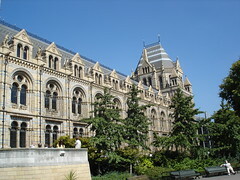 In addition to the dinosaurs my other recommendation is the Earth Sciences halls. 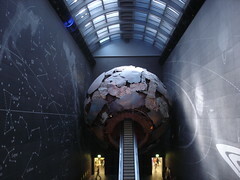 From its main foyer you can normally take an escalator through a formative globe. Sadly, this was closed so to the stairs and viewing the exhibitions in reverse it was. Looking at various crystals isn’t overly stimulating but they are shiny. Shiny! That’s not distracting at all. 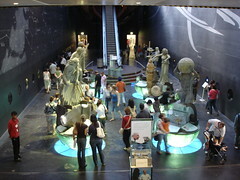 Further up you will find a history of geology done through the vivid use of volcanoes and earthquakes as teaching aides. Walking through the history of space gleaned this gem from one of my fellow museum goers “I thought this was a natural history museum not a space museum.” Methinks someone needs to spend more time in the museum. Lastly, you have the opportunity to walk through an well designed history of the planet’s geology, geography and animal & plant evolution over its entire history. Whether this will interest you or not is obviously a matter of taste but with many other areas of focus such as marine life, plant evolution and humans. Much like the escalator there were various exhibits closed on the day I visited. This proved to be something of a boon as the whole museum takes hours to walk around and being able to cut it down is advantageous albeit disappointing. 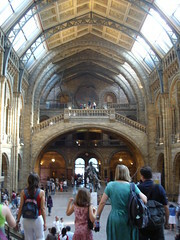 By no means should you be put off from visiting the museum because it may take time, you can rush through if necessary and move onto the next tourism hot spot. 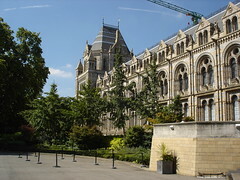 A free, immersive education experience makes the Natural History Museum a worthwhile excursion and in my opinion is better than its neighbour the science museum.